Being a teacher was an important part of Alysia’s life. It wasn’t just her source of income – it was part of who she was. Alysia lived in a small rural town in WA. School was not only her workplace but a social hub within a caring community and her support network as a single mum of two small children. Her idyllic country life was turned upside down in May 2010 when she was diagnosed with breast cancer at the age of 33. Alysia had to travel about two hours each way to Perth for her appointments. She knew it would be impossible to keep working through her treatment, which included a double mastectomy and chemotherapy. ‘I immediately went on sick leave and, when that ran out, I went on leave without pay while I continued my treatment,’ she says. Alysia was very unwell throughout her treatment. ‘I could not live independently, and was certainly in no position to return to work,’ she says. Alysia’s return to the workforce started with casual contract work seven months after her diagnosis. A couple of months later, she started working two days a week in a curriculum-based role. ‘It gave me a modest income while I was still recuperating,’ Alysia says. Over the next couple of years, Alysia was able to gradually add more working days to her role, before finally resuming full-time work. ‘Now – eight years later – I generally function well, but there are still some cognitive scars. Alysia is disappointed by the stories she hears of workplaces being inflexible to accommodating people’s needs after a breast cancer diagnosis. ‘Employers need to understand that mental health and wellbeing is very closely tied to self-image, including how a person affected by breast cancer perceives their value in the workplace. While there is a well-established support system in Australia for injured workers, there is no system to support people to stay in or return to work after a cancer diagnosis. BCNA is committed to improving support for people in the workforce diagnosed with breast cancer. facing breast cancer if you are self-employed. There is also information and tips for employers and colleagues. 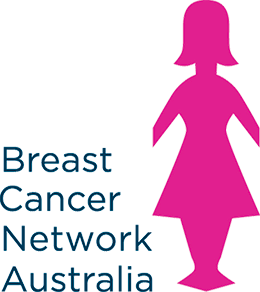 BCNA is hosting a work and breast cancer online webcast in November. To access the hub or register for the webcast, visit bcna.org. au/work-and-breast-cancer. BCNA gratefully acknowledges the assistance of Sussan in funding research and resource development for this project. This project is a Cancer Australia Supporting Women in Rural Areas Diagnosed With Breast Cancer Program initiative, funded by the Australian Government.